I wasn't really around to post anything during Thanksgiving, so let me now give you the obligatory turkey-related posting for the holiday. Maybe a lot of people know about Uncle Ray's, but to say their deep fried turkey is world famous...well, that is quite a tall order. What about other places whose deep fried turkeys are supposedly "world famous." Go ahead, do a "world famous deep fried turkey" phrase check on Google. Can all of these be "world famous"? If so many claim to be home to a world famous deep fried turkey, then don't these phrases lose all meaning? And another thing: when they say "world famous," do they really mean world? 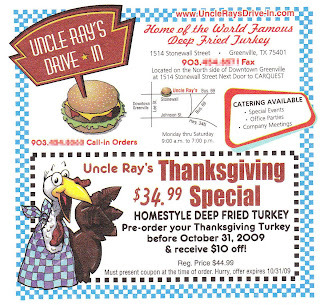 Next time you're in Brazil, Pakistan, Ukraine, or Swaziland, ask the folks there if they know of Uncle Ray's deep fried turkey.